"Think Mrs. Doubtfire on crack." "What would Demi Moore's list include? 'Lunchables for Ashton'?" "...she fills the characters out and colors them in like a loving forensic detective with a macabre sense of humor." "This incredible new book takes the found grocery list concept and elevates it to a whole 'nother level." "A La Cart is a book by Hillary Carlip who may have bumped every other human being in the known universe (well, there might be a few exceptions that I can think of. . .) off the list called "In the Running For Funniest Person Ever." 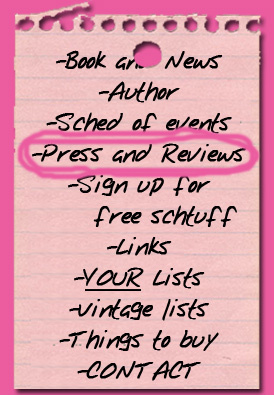 I don't actually keep such a list, but I am about to start and she's going to be in the top five. Likely the top two. Maybe even the Number One." "The transformation is remarkable; part of the fun is looking for the real Carlip underneath the facade." "Believe me when I say: [A la Cart] is awesomely awesome." 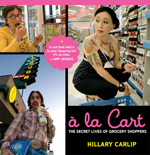 "You want this book: Hillary Carlip's A la Cart." "We better keep an eye on Hillary. Shell wind up ruling us all." "For an over-the-top look at how one creative free spirit gets inside the heads of shoppers, check out A la Cart. " "A book based on grocery lists?"